This "Tree of Life Morris & Dearle" tapestry shows a gorgeous tree of life based on the works of William Morris and Henry Dearle. Filled with beauty and grace, this piece shows the trademark artistry of the works of Morris and Co, which were designed by William Morris, Edward Burne-Jones and Henry Dearle. In the gorgeous Pre-Raphaelite style, we see the tree with green leaves and apricot flowers, in a dark background, with forest flowers, and a gorgeous border filled with flowers and foliage. The tree of life is a symbol of life giving nature, and here we see a wonderful piece showing this tree to gorgeous effect so typical of William Morris tapestry designs. 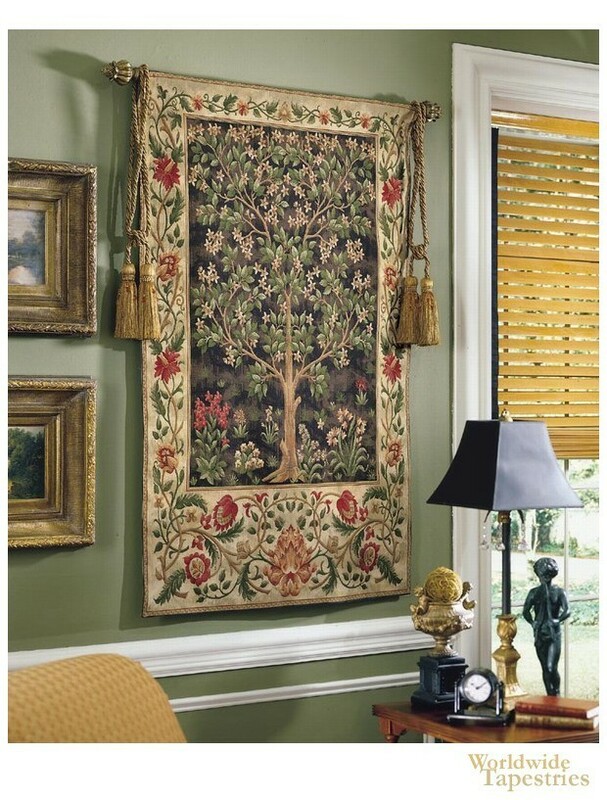 This "Tree of Life Morris & Dearle" tapestry is backed with a lining and has a rod pocket for easy hanging. Note: tapestry rods and tassels, where pictured, are not included in the price. Dimensions: W 55" x H 72"